Recommendation: Recommended for Bf 109 and Italian Air Force enthusiasts. Monogram's "Messerschmitt Bf 109 in Italian Service" by Ferdinando D'Amico and Gabriele Valentini is a fabulous reference book which is, alas, long out of print. A number of other books have touched the subject of Italian operated Bf 109s while considering broader issues, including Squadron's two-volume "Regia Aeronautica" publications, Airlife's "Air War Over Italy" and Hikoki's "Courage Alone". Italian publisher Ali D'Italia has revisited the specific subject in detail with the first book in their new series "Ali Straniere in Italia", Messerschmitt Bf 109 Italiani. This soft cover 80 page book is presented in A4 format and is packed with photos, profiles and bi-lingual text (English and Italian) covering the earliest Italian use of the Messerschmitt Bf 109E to the Bf 109K-4 in ANR service. Two of the highlights are the seven excellent wartime colour photographs, and the 44 colour profiles. These aspects alone are great inspiration for modellers of Bf 109s or Italian fighters. References are broadly drawn from the abovementioned earlier texts and supplemented with a number of photos that have appeared in other publications, but also some more recently unearthed images that I have not seen before. 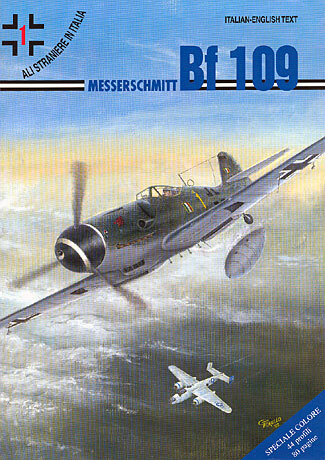 This book also benefits from some of the newer interpretations of Luftwaffe late-war colours and Bf 109 variants. If you have the slightest interest in Italian aviation in WWII and the Messerschmitt Bf 109, then you will find this book to be very useful and interesting. Thanks to Guglielmo from IBN for the review sample.